Dunn township was the forty-eighth township organized in the county. The first specific mention of the township dates back to September 4, 1873, at which time the commissioners attached it to Scambler for township purposes, but it was not until seven years later that the population was such as to warrant its organization as an independent civil township. The law provided that a congressional township must have at least twenty-five legal voters before it could petition for organization as a civil township and it took a majority of the voters to effect the organization. One of the most prominent of the early settlers of Dunn township was George W. Dunn and his standing in the community is shown by the fact that when the congressional township in which he lived was organized on March 16, 1880, the commissioners named it in his honor. The petition asking for the organization of the township was dated March 9, 1880, and carried the following names: O. A. Burdick, D. Burbank, H. C. Jordon, L. T. Cornish, W. G. Burbank, G. W. Dunn, Reuben Page, J. A. Page, Samuel Dunn, Phillip Lapp, Lemuel H. Baker, William Page, William H. Moon, William E. Dunn, Charles Baker, I. N. Hubbard, Albert Miggdorff, Isaac Johnson, Orrin Cowles, Payson E. Epham, Eli O'Neilly and Charles Hyatt. The petitioners had asked that the new township be called Blaine, but the commissioners refused their request and honored Dunn by calling it after him. The board fixed April 5, 1880, for the first election and ordered it held at the house of George W. Dunn. This is one of the many townships of the county which has experienced difficulty in getting a satisfactory name. A petition dated July 26, 1882, and signed by O. A. Burdick, Reuben Page, C. Hyatt, W. H. Wood, Joseph Kranick, George W. Dunn, S. W. Baker, J. A. Page, William A. Dunn, Hollis Peirce and D. Burbank was presented to the county commissioners on January 5, 1883, asking that the township be named Marysville. However, the board did not grant their request and as a result a second petition was at once circulated throughout the township asking that the name be changed either to Brighton or Mobile. This second petition, dated March 13, 1883, and presented to the board on the 26th of the following July, bore the following signatures: O. A. Burdick, P. E. Upham, O. Bonnell, J. A. Page, H. C. Jordan, I. N. Hubbard, Peter Danielson, John Drews, Henry Williams, John W. Cody, Milan Crocher, Christ Matzdorf, Edwin Richter, Joseph Kranick, William H. Woal, William E. Dunn, Jacob Johnson, M. H. Gore, O. S. Johnson, G. W. Derwin, E. M. Hardin, S. H. Dunn, P. Page, Cyrus Dana, Chas. Hyatt, F. W. Dickrey, George Cornish, W. S. Young, Orvin Cowles, W. E. Page, Isaac Johnson, Isaac D. Johnson, Simund H. Baker, Hollis Peirce, G. F. Gorr and H. C. Bragg. Again the commissioners refused to change the name of the township and thus came to an end the efforts on the part of the citizens to have their township rechristened. 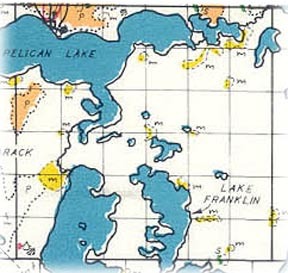 Dunn has parts of three large lakes within its limits, namely, Pelican, Lizzie and Franklin. Pelican river enters this township in section 1 from Becker county and flows through Little Pelican, Pelican and Lizzie lakes. The surface of the township is exceedingly rugged in many places and with its lakes and wooded hills makes one of the most picturesque townships in the county. No village has ever been platted within its limits, although four summer resorts have been platted since 1902. These are all located on the shores of the lakes and are populated only in the summer season. Killarney Beach was platted by Martin Aalberg on October 29, 1902, for Minnie H. and M. C. Barry. It is located on the shores of Pelican lake in section 4. Provan Beach is located on the shores of Pelican lake in sections 4 and 9. It was platted for Samuel J. Brown by Nathan Butler and recorded August 27, 1907, in the office of the register of deeds. Midland Beach was platted by Emanuel Neilson for John K. and Agnes B. West. It is located in the northern part of the township in section 2. The plat was recorded July 23, 1908. Sun Light Hills is located in the northern part of the township in section 3. It was platted by John Oss for Mike Murphy and recorded March 27, 1912. The present township officers are as follow: Supervisors, William Holbrook, John J. Kvare and W. B. McLeod; clerk, Anton Peterson; treasurer, Leonard Johnson; assessor, H. O. Hagen; justice, Leonard Johnson; constable, Daniel Arickson. Places of birth for Dunn Township in the 1905 state census.